The bumper of his borrowed car had this sticker that read "Drift to Jesus." Strange that in a sport seemingly propelled by the need for breakneck speed and wayward egos, one driver found his mission to proselytize. Wearing my writer's hat on assignment for InFlight magazine gave me a chance to get out of my usual comfort zone of visiting/documenting travel sites and a rare opportunity to ride with Audel Sison aka Dr. 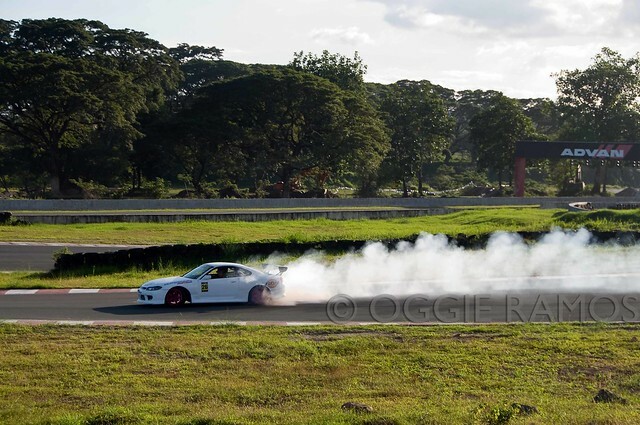 Drift, the 2011 Philippine Pro-Am Lateral Drifting champion. Part of the assignment was to actually drift with Audel and for someone whose driving speed max out in the 130s-140s, the experience was, pardon the cliche, a pure adrenaline rush. I rode with Audel to the far side of the Clark Speedway when he offered to drift with me right there on the uphill loop while waiting for our photo team to arrive. Wow, no time to get my head together but it was an offer too good to pass up. He quickly got into 130 and initiated the first sideslip. Frankly, I didn't have time to get scared out of my wits or even time to think of anything much. I had no seatbelts on but that hardly mattered as I seem to have melded into the bucket seat. Time seemed to have slowed down and only Dr. Drift was moving in real time, looking serene nimbly steering while the tires squeal and burn, piercing the silence of the sunny afternoon. 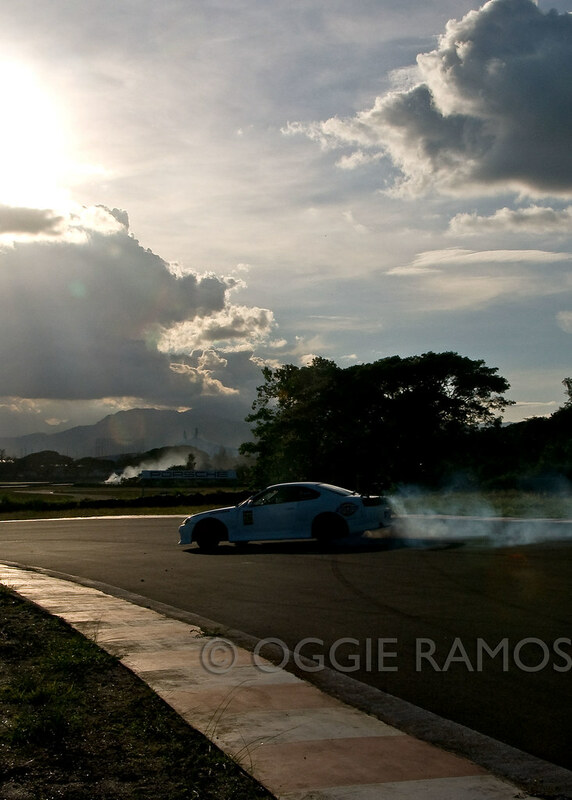 "Drifting is like poetry in motion... it's controlling the uncontrollable." I didn't expect Dr. Drift to be as adroit with words as he is with the steering wheel but Audel doesn't fit the brash, egoistic race driver stereotype. The original plan was to get his insights on drifting as a thrillseeker's sport. But the more I probed, the more interested I got in the backstory, in the person behind the persona. At 42, Audel isn't an overnight success. Far from it. He was into BMX, dirtbike, motocross, rallye and drag racing in his younger days. 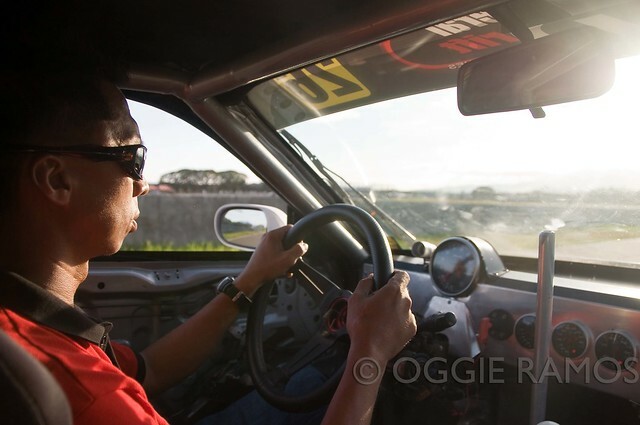 He copped second place in the first-ever drifting competition in the Philippines way back in 2006, riding a borrowed bone-stock Toyota Corolla. But after that, his racing career and life went into a tailspin. In 2006, he had an encounter with God. In 2007, he disappeared from the scene. In 2008, he got back riding on borrowed cars. In 2009, he rode against the pros -- something he called akin to "using a dagger against a sword." In 2010, he got sponsored by Fern-C riding their Mercedes Benz. He racked up second and third places here and there but never first. He thought, "it looks like God is trying to make sure I can handle winning. Before that (encounter with God), pag andun ako, gusto kong manalo because it's a bragging right. (When I was racing before, I want to win to gain bragging rights) Now, after winning, what do you do? Sabi ko (I said) I'll impart it." It's not the first time I've heard of passion that runs so deep, it turns into a life-changing spiritual experience but hearing it firsthand from Dr. Drift makes it so affecting and so believable. Audel credits the spiritual transformation for his calm and composure (and success) on the track. "If you're not ready for the adrenaline rush, it will take over. You should ride your adrenaline. You should be in control of it," he advises. "Yan ang sabi sakin ng mga judges in 2006 and 2008, ang galing mo Mr. Sison pero pag nanggigil ka, wala na... (that's what the judges told me in 2006 and 2008, 'you're good but when you get high on adrenaline, you falter)". I can contain my adrenaline." Wise words to heed for aspiring drifters. It's something he imparts to his own students. Another Yoda-like nugget: "It should come to a point in your maturity as a driver (when) you and the car become one. Every movement, every nudge, alam mo kung saan pupunta, ano ang kailangang dagdagan-bawasan (you know where the car is going, what you need to adjust whether to increase or decrease)". One thing I've discovered that surprised me is how safe the sport is. And I thought that the "Drift to Jesus" bumper sticker is really double-entendre to also mean "this sports gets you so close to the edge you'd likely call on our Creator." "Naka-case and naka-wrapped ka, (you're encased and wrapped all around). The car is really rigid in case of collision. And may 4-point seatbelts." But his most reassuring words? "When you ride with the pros, they know what they're doing." Seeing firsthand how he calm and collected he was while drifting, I believe him. Recommended link: I've asked Audel to describe drifting in his own words but I guess nothing beats seeing him in action to get a feel of the action. Watch him here. Author's Note and Attributions: This post is derived from an interview for a writing assignment for InFlight Magazine. All photos are my own. 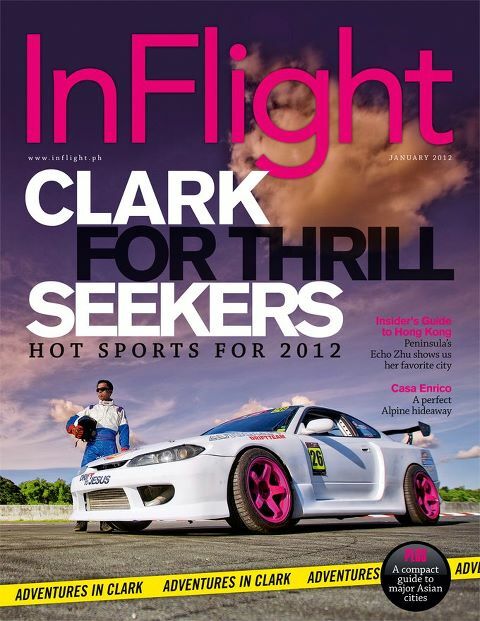 A separate article I authored entitled "Clark for Thrill-seekers" appeared in InFlight Magazine's January 2012 issue. Many thanks to InFlight Magazine and Dr. Drift's team especially Jay Ribu for making this interview and post possible. • InFlight Magazine is available onboard Seair flights and at selected retail outlets. • For inquiries on drifting classes, email Audel at autocraft_drift_team@yahoo.com or call 0927-6018133/0922-4254900 or visit Autocraft Drift on Facebook. 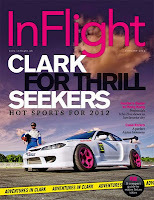 To read the article in InFlight Magazine, please click this link.